After roughly a month since MLB The Show 18’s release and start to the MLB season, the year’s first roster update has finally been unveiled by San Diego Studio (SDS). 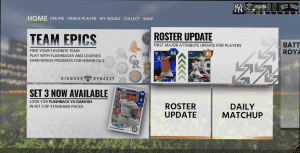 The live roster affects both play now games and Diamond Dynasty modes, and receives updates throughout the year. Below are all of today’s major changes. Today’s main screen for Diamond Dynasty mode in MLB The Show 18. Surprisingly, only one player was upgraded to diamond level (85 overall or higher), and none were downgraded from diamond to gold. Being that this update comes after around 25 real-life MLB games (most occur after around 12 games), expect it to be one of the most turbulent roster updates of the year. In addition to the live roster update, All-Star flashback Yu Darvish (87 overall diamond) was added to packs as part of Set 3. SDS announced on an April Twitch broadcast that roster updates for MLB The Show 18 will be going out every other Friday at 12pm PST/3pm EST. The next update is scheduled for May 11. What do you think of today’s roster update? Did SDS miss anyone? Let us know in the comment section below, and don’t forget to subscribe to Sports Gamers Online. And be sure to hit the bell to be notified whenever we post a new video.